Why? 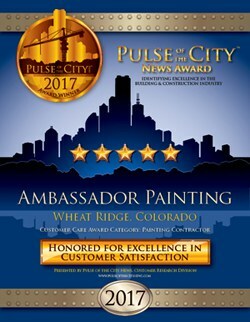 Because Award Winning Ambassador Painting wants to be Your Denver House Painting Contractors with outstanding Customer Service! 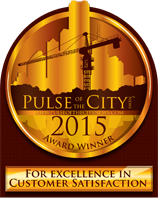 Ambassador Painting is proud to announce that we have received the 2018 Pulse of the City News Award for Excellence in Customer service. 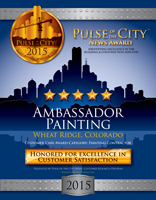 Expertise awarded Ambassador Painting as one of the best painters in Denver! Expertise analyzes and scores each business across 25 criteria to provide a hand-picked list of Denver’s best painters. 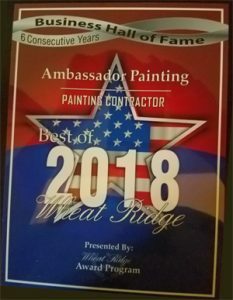 For the fifth year in a row, Ambassador Painting has been recognized for “Best of 2013/2014/2015/2016/2017 – Painting Contractor” for our integrity in business in the city of Wheat Ridge! 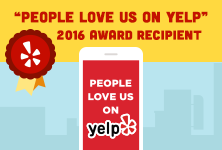 With the five years in a row of being nominated for the Best of Wheat Ridge Business, we have also had now been nominated for the “Business Hall of Fame” in the city of Wheat Ridge, Colorado. Based on the independent research of The Pulse of the City News, Ambassador Painting has won the coveted STAR AWARD for 2015 by combining superior construction product & excellent customer focus! 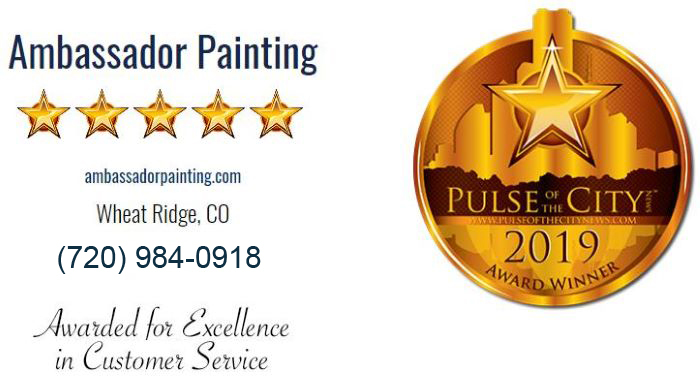 Ambassador Painting of Denver considered one of the best house painters in the Denver metro area including Arvada, Aurora, Broomfield, Thornton, Westminster, Wheat Ridge, Erie, Centennial, Highlands Ranch, Lakewood, Castle Rock (north), Parker and Littleton. Our #1 priority is to make sure that you enjoy top quality results from your house painting project. Our team of professional home painters also look for new creative cost-effective ways to help beautify and protect your home exterior or interior for years to come. 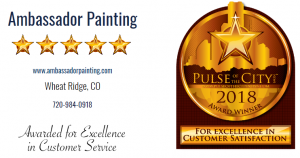 Work ethic, product knowledge, attention to detail, and clear communications, coupled with Honesty and Integrity is how Ambassador Painting does business on a daily basis to be one of the Best Home Painters in Denver. Ambassador Painting house painter professionals are constantly monitoring our industry to stay on top of the latest advances in materials, tools, and techniques. In doing so we can assure our customers that not only will there finish project look amazing, it will have the protection it requires to stand up to Denver Colorado’s unpredictable and sometimes harsh weather. Our team of professional house painters uses a Hand Brush and Roller technique to seal your home in beautiful warm colors for years to come. We start with hand scraping and sanding then move to repair loose boards and nails before we use a premium grade caulk. Once the exterior of your home is in good shape we will apply our hand brush and roller technique to seal the deal. You will be completely satisfied when you see the finished project. You need a quality Paint Contractor in Denver just like Ambassador Painting to help guard your home against the harsh Colorado weather conditions. We use Hand Brush and Roller techniques help to ensure a strong barrier against the elements that are usually harmful to your homes exterior materials, like wood, siding and other composites for true Quality House Painting Denver projects. 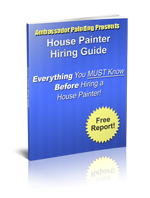 What can you expect from Ambassador Painting as your personal house painting contractors in Denver? Ambassador Painting offers quality hand brush and roller techniques for both interior or exterior painting projects. Click Here to fill out our online form to request your free estimate for your next house painting project. You see, complete customer satisfaction is not just a saying for us, in fact, it has become our passion. Our employees work exclusively for us. 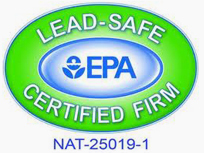 We do not subcontract our work to outside sources for high-quality standards. All job sites are staffed with a foreman and a team of quality professional house painters. Ambassador Painting is a family owned company that maintains a top-notch rating with the Better Business Bureau as a Denver house painting contractor. 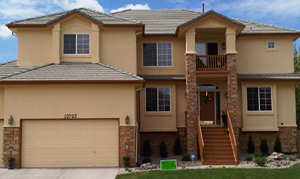 We want to be your Exterior House Painting Contractor in the Denver Colorado metro area. Why is Ambassador Painting your best choice to paint your home? As an honest and hardworking company, Ambassador Painting have a wealth of references and testimonials from our customers. 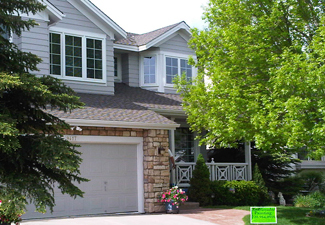 Referrals are how we have grown to be a premier House Painting Contractor in Denver Colorado. If you are looking for a house painting contractors in Denver or surrounding area that will hand brush and roller paint the interior or exterior of your home call us! 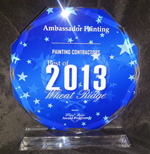 Call Ambassador Painting Today at 720-984-0918 to schedule your free estimate. You have many Denver painting companies to choose from so we want your decision to be easy. Ambassador Painting serves Denver, Arvada, Aurora, Broomfield, Thornton, Westminster, Wheat Ridge, Erie, Centennial, Highlands Ranch, Lakewood, Castle Rock (north), Parker and Littleton.